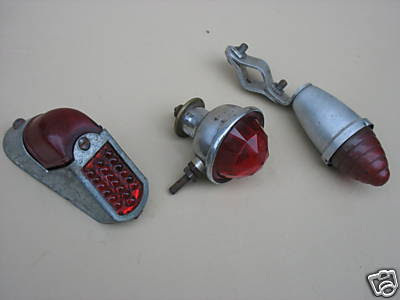 Even more taillights and reflectors, found on eBay France... #1 Vitalux reflector, 5.1 cm diameter. #2 Lens for Luxor taillight (unfortunately heat damaged). #3 Unmarked taillight in aluminum with plastic lens. 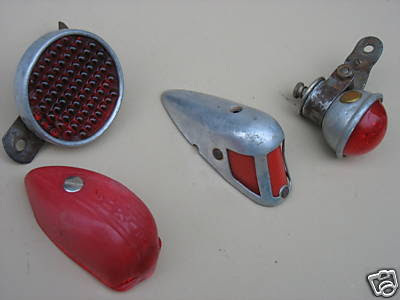 #4 Radios taillight with plastic lens and indicator lens in the top. #5 Vitalux taillight in potmetal with plastic lens and glass reflector. #6 Unmarked taillight in chrome and glass, 4.5 cm diameter. #7 Pinecone-shaped Vitalux aluminum taillight with plastic lens. Radios taillight (#4) is similar a battery-operated light I already have, but this one has a shorter tube (no room for batteries).